Silla was one of the kingdoms of ancient Korea. It existed from 57 BC to 935 and is famous as the longest sustained country in Korean history. The name, Silla, implies that the virtuous achievements of the king are renewed every day and extended all over the world. Silla was founded by King Park Hyeokgeose in 57 BC, around Gyeongju in the southeast part of the Korean peninsula. Although Silla was founded earlier than Goguryeo and Baekje which coexisted with Silla during that time, it took more time for Silla to build firm government structure than those kingdoms. However, around the 6th century, by accepting Buddhism, Silla made its royal power stronger. Around the 7th century, Silla acquired the Han river area, which was the most important area in Korean history. Finally, Silla conquered Baekje in 660 and Goguryeo in 668, with the Tang Dynasty of China as an ally. In the last stage of Silla, the king and noblemen indulged in extravagance, and it provoked the people to rebellion. The later three kingdom period began as Gyeon Hwon founded a new country, later Baekje, succeeding the ancient Baekje, and Gung Ye built Taebong succeeding ancient Goguryeo. Silla could not withstand their growing force, and finally surrendered to Goryeo in 935 and collapsed. Gold ornament from early Silla. A golden inner cap. 5-6th century Silla. Reliquary from 7th century Silla. 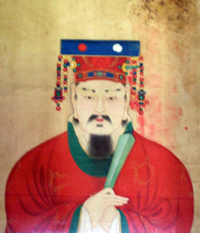 The last king of Silla, King Gyeongsun (r. 927–935). A crown from late 5th or early 6th Silla. 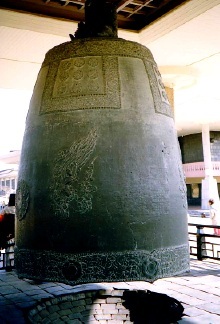 The Silla bell was cast in 771 CE. This standing statue of the Bhaisajyaguru Buddha is made of gilt bronze, made in the Silla period. Silla Facts for Kids. Kiddle Encyclopedia.